Cook the ramen in boiling water for 3 minutes until tender. Strain well and let cool a bit. Beat the egg. Add the cooled ramen and egg to a bowl. Mix well. Grease the container and put the ramen in it so that the ramen is a little over a half-inch in thickness. 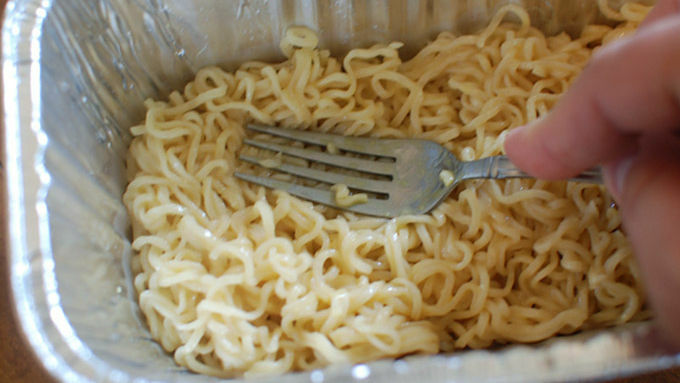 Press down with a fork to compact the noodles, then allow to cool in the fridge for 15 minutes. Meanwhile, cook the bacon and get the cheese ready. 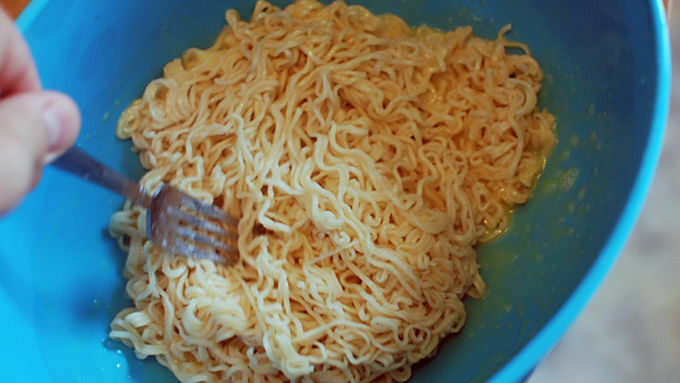 In a frying pan, add some butter and turn the ramen out from the container into the pan. Cook until the ramen is just lightly browned on the first side. Cut ramen in half. 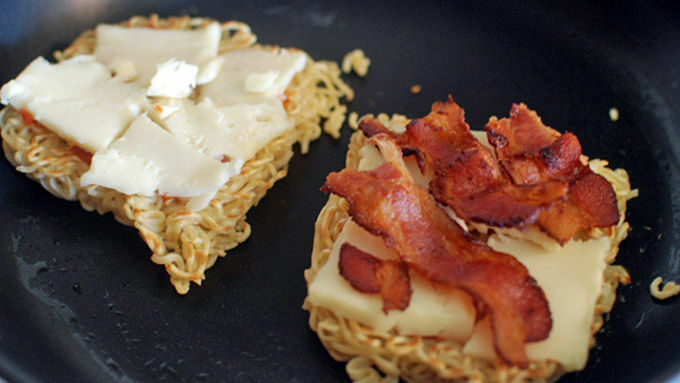 Flip the ramen patties over and drizzle the top with sriracha, then add the cheese and bacon. Leave open-faced for about 7 or 8 minutes, with the pan covered, to allow the cheese to melt into the noodles. Finally, flip the 2 pieces together with the ingredients on inside to build your sandwich. Let it finish browning on each side as needed before serving. Ramen noodles and grilled cheese come together in one glorious sandwich. Thanks to the famous ramen burger, we all know that ramen can be fused together and used in place of bread. So what else can we do with this idea? 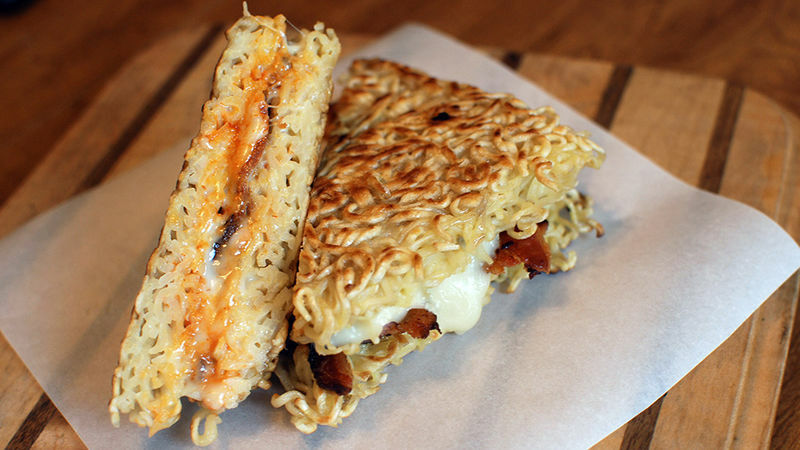 Grilled cheese is actually the perfect application for ramen-bread. The really cool thing about this idea is that the cheese oozes right into the nooks and crannies in the ramen, so you end up with almost a handheld version of mac and cheese. The addition of sriracha and bacon make this sandwich more complex and less of a one-note flavor profile. Now, you might have your doubts about this sandwich, but after only one bite, you'll realize just how amazing it really is and won't stop eating until the whole thing is gone! To form the ramen noodles, we used one long container for “bread slices” and just cut it into two pieces, but you might want to do it in two separate containers depending on what you have. This is such a good sandwich! It held together so well and is really delicious and unique! Give this fun twist on a classic a try the next time you're craving something a little different.